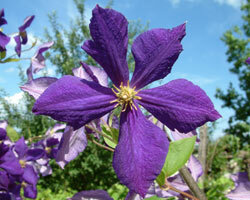 Our big 2.50 metre high "Catalpa" tree was comprehensively pruned last autumn, and the crown was severely thinned out. This year in June large numbers of small, pale white hairy lice appeared. 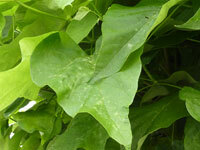 At the same time, there were oily black drops all over the leaves, spilling onto the ground (fig 1) . On June 22nd the tree was treated with Petroleum 30 C (6 pellets in 20 litres of water), poured onto the roots, and the oily drops subsequently disappeared. But then an even stronger glistening, sticky honey-like film appeared on the leaves and the ground beneath the tree. Seven days after Petroleum 30 C, we applied the same dose of Sulphur 200 C (twice, at an interval of five days). Some leaves fell off since they had died due to the sucking action; but the lice only slowly diminished in number. On July 9th 2015 Maute-Rundum 30 C was applied by watering the tree with a solution of 8 pellets in 30 litres of water. The lice then rapidly declined, and had completely disappeared by July 14th (picture 2). "Now I'd like to tell you about my 'successes', which leave me rather 'speechless' but in a nice way! I've got a series of large hibiscus pot plants. Every year when I bring them back into the house, they quickly come down with aphids. Then I give the plants 'poison capsules'. One dose keeps the plants free of aphids the whole winter. So that's what I've been doing with success (though not with a clear conscience!!!) for years now. This year everything was different: one plant was covered in black aphids (buds and flowers), and the aphids were not repelled even by repeat doses of the poison capsules. They were constantly reproducing but thankfully did not attack the neighbouring plants. When I got my homeopathic remedies, I put a few pellets of Cimicifuga 30 C in a sprayer, shook it, and sprayed my hibiscus. The next day I could scarcely believe my eyes – the aphids were gone. I sprayed a second hibiscus suffering infestation with red spider mites. Nothing happened! Then I sprayed it with Petroleum 30 C – all the spiders and their webs were gone!!!!! I can scarcely believe it!!! I just did not reckon it would work so quickly!! Unfortunately I didn't take any pictures – as evidence!!! Now I really hope that Helix tosta does the job for slugs – which will certainly be out in force after the mild winter!" Small fruit trees in container were raised in the house on the window sill. The leaves were infested with lice and watered once with Aphidius. After a few days, the lice disappeared. The small damson tree remained lice-free. The lice returned to the small cherry tree after a while. Green aphids on the tips of the rose shoots: Coccinella 6 was sprayed and after about 3 days there were no more aphids to be seen. Unfortunately they reappeared and a further spraying with Coccinella did not help. Then I sprayed with Chrysoperla carnea and the aphids were gone – so far (approx 3 months), they haven't returned on the roses I treated. We had severe aphid infestation on our cucumbers. Following the recommendation of V. D. Kaviraj, we watered these and all other plants at an interval of one week with liquid Coccinella 6 D. There were fewer insects afterwards. Around 2 weeks later we repeated the application. The infestation, also on our roses, has not appeared again since then. Great! Coccinella D6: Green aphids on roses, sprayed 1x with the sprayer, the rest were watered on the roots. After approx 1 week, the aphids had disappeared. Coccinella D6: Green aphids on the tips of rose shoots, 3x sprayed with diminishing dosage on the days indicated by the planting calendar. Aphids diminished and had disappeared after 14 days. Coccinella D6: Black aphids on blackberry, roses, and cucumbers were watered and sprayed on 3 successive days. After 3 further days, there were no more aphids to be seen. For the last two years I have used no chemicals in my garden and treated all pests and fungal infections with homeopathic remedies. My impression in the second year is that the plants are generally stronger and more healthy so they do not immediately fall prey to aphids and caterpillars. The roses only needed a single treatment in spring, following which the aphids were gone for the whole year. The same was true for black spot. To reduce the effort required to treat the plants throughout summer, I filled large (approx 500 ml) screw-top jars with water and 10 pellets of each remedy. I stored the jars in a cool, shady place. Then I stirred the mixture vigorously when required, and poured one third into a watering can (7 litres) or a large sprayer, once more stirring it vigorously, and then using it immediately. The plants were either watered or sprayed until they were dripping wet, with the remainder added to the root area. 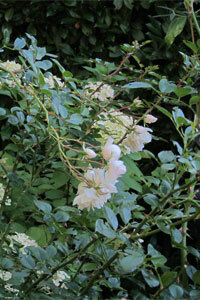 Last year I treated the roses for green aphids using Cimicifuga 30C, as recommended by Christiane Maute. But this was not especially successful. When the black spot reappeared, I applied Rhus tox 30C (Christiane Maute says this is especially good for roses), which worked well. The new shoots were healthy, unlike the previous new growth. Since the summer was quite humid, I had to repeat the treatment after a while. This year I treated all green aphid infestations with Cuprum 30C (for insect infestation and pests in general), which quickly proved successful. All plants, whether rose, hibiscus or currants, were treated for green aphid infestation with Cuprum and for black aphid infestation with Camphora 30C. I did not differentiate by plant but by pest. 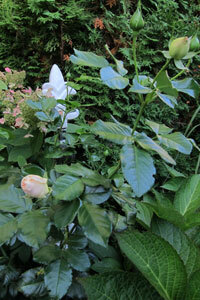 Note that my plants were given fresh earth and compost in spring, and the roses received slow-acting fertilizer. They are not weak and are watered sufficiently. This influences the remedy choice. When black spot appeared anyway, I used Rhus tox again (just once). I did nothing more after the treatment in spring. 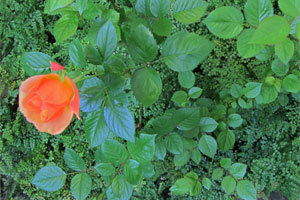 The roses remained free of aphids and the black spot only appeared on one or two leaves, which I plucked off. Another thing I noticed was that, when the hot period was followed by cooler weather with rain, the roses revived, with new shoots and buds appearing. I have never had such beautiful roses in autumn. But the very hot weather is less likely to have encouraged fungal growth on the roses, as occurred in the wet summer of 2014. Ledum 6D: Aphids: Brief report on my (first) experience of treating plants with homeopathy: strong and repeated aphid infestation (mostly green ones, a few black ones, too) on a rue. The use of beneficial insects as pest control was not successful in the long term. 3 pellets Ledum 6D dissolved in ca. 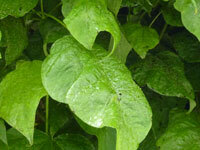 300 ml water, watering of the plant in small amounts over a period of several days. The first few days more frequent, then in reducing frequency. After about 1 week, no more aphids to be seen – this has been the case for 4 weeks now. 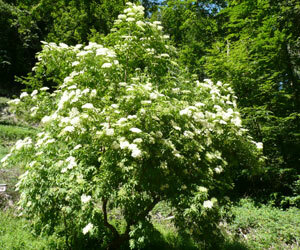 In Ms O's garden there is a very big elderberry bush, which was visibly afflicted in June this year by countless black aphids. So Ms O. began treating the bush by spraying it with Cimicifuga 30 C (6 pellets in 10 liters of water), according to the recommendation from Christiane Maute, repeated for three days. She observed that the number of aphids declined from day to day. On the fourth day, she continued treatment with three doses of Staphisagria 200 C, which is also indicated for aphids. After two weeks, the elderberry bush was completely free of aphids. planted in spring; Slight infestation with black aphids (protected by ants).Treated on June 25 with Staphisagria 200 C.
Today (July 7) completely free of infestation. Tropaeolum 6D: In a 30-year-old Swiss pine, with severe mealy bugs, a single spraying and a single watering with Tropaeolum 6D (5 ml /10 liters water) brought excellent results (after approx 1 week).